Michael James Scott in "Aladdin"
Michael James Scott has traveled far and wide with the hit Disney musical Aladdin, both on tour and in Australia, where last year he won the prestigious Helpmann Award for his performance as the ever-ebullient Genie. 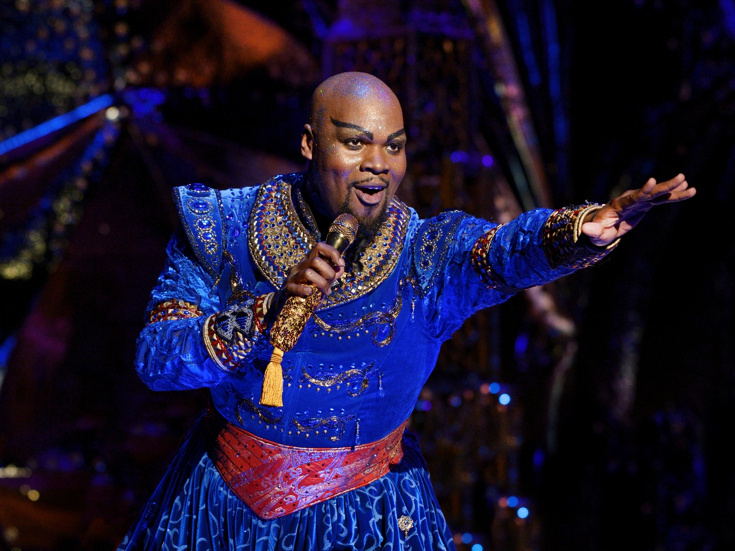 He can currently be seen in the ongoing West End production at the Prince Edward Theatre while the part’s local originator, Trevor Dion Nicholas, performs the Genie in Pittsburgh, Nicholas’s hometown. Broadway.com caught Scott the day before his first London performance to talk about keeping his bags packed and claiming a favorite role afresh. How does it feel to be continuing your global travels with the Genie, this time in London? I’m on my “Genie journey,” as I call it! This character is the heart and the love and the light of this show, and has so much heart, which I think we need in this world today. I feel so blessed to be able to put a lot of love out there; I couldn’t be more honored to be able to do that. Did you ever imagine that you’d be able to swap over with the show’s London originator, your fellow American performer, Trevor Dion Nicholas? We got to do the great Genie swap of 2018! It’s so cool: they [Disney Theatricals] were like, “Would you like to go to London, so that Trevor gets to do the show on tour to his hometown [Pittsburgh]?” We’ve just been in Boston and then Buffalo, and I believe I pick up [the tour] again in Louisville. Every time I rejoin the show, it feels like another home. Is it as fun a role to play as it appears, at least from the audience? What’s great is to play a role where people are waiting to love you. Whether people are coming for the first time, or the fifteenth time, they want to see the Genie, so I intend to take [this part] and run with it for as long as I can. Is it liberating to be able to connect directly with the audience? Are there adjustments you are having to make to the part for a West End public? Some of the British phrases that are used here are now actually set in the show, but I do get to throw in some of my Michael-isms, as well. And I will say that this [London] company can do an American accent amazingly well. It feels like the British can do American accents better than the other way around. Is there something about this role that it can only be played by men with three names—Tony winner James Monroe Iglehart, Trevor Dion Nicholas, you? Now that you put it like that, perhaps that is the first requirement for playing this part! You know, I think it’s a just coincidence that it has happened that way, but we’ll certainly take it. We’re the three-name wonders—the opposite of Madonna or Beyonce! Do you feel surrounded by friends here in London? You posted some happy photos online of you backstage at Dreamgirls. That was just last night [as of the time of this interview], and it was a little bit of an emotional evening! Marisha [Wallace] and I go back to the original company of Aladdin on Broadway and then Something Rotten!, and Joe Aaron [Reid] and I have known each other for years: we would see each other at the gym. Asmeret [Ghebremichael], the Lorrell, is literally one of my best friends; she’s like my sister. We opened The Book of Mormon together. Was it kind of surreal seeing them all together? It was so ridiculous to see them on a London stage, and in this show, which I have been dying to see for so long! It’s a gift to see your friends doing well. What about Patti LuPone, who’s here rehearsing Company, coming to the Gielgud Theatre—where you did Hair in London in 2010? I would love to see Patti in that show, and I love what they’re doing with that production [changing the central character, Bobby, from a man to a woman]. And, I mean, it’s Patti LuPone, so c’mon! Given your continent-hopping, and also going between cities on the American tour, are you now a seasoned traveler? I’ve definitely become very good at it. For a long time, I was so spoiled and never left New York except for out-of-town tryouts and the time I spent 14 or 15 years ago on the U.K. tour of Fosse with Ruthie Henshall, who’s the Patti LuPone of London—a West End legend! I was Ben Vereen’s standby and took over from him in Paris, which is crazy, right? More recently, I’ve been doing so much traveling and have really come to love it; I love seeing a new city and definitely believe in putting myself out there in the universe. Are you homesick at all for New York? You know, I haven’t been in New York for over two years! The crazy thing is that I consider that town my community but it’s been two years and some change since I have been there. My partner is a film director, and so we did a huge change and moved to L.A., but it still feels strange because I am such a New Yorker at heart. We actually gave up our apartment there, so now I am technically based in L.A., but New York will always be part of my life. What has affected you most personally about taking this role to the world? I spent 18 months with Aladdin in Australia and that really was an unbelievably life-changing experience. There aren’t a lot of people like me in Australia so I stood out, if you will. That really was a beautiful time. Have you spoken to your Aladdin director Casey Nicholaw about ever joining his concurrent West End company of The Book of Mormon? We did chat about that a while ago and talked about that possibility, but what would be really fun would be to open a show fresh in London for this community. At the same time, I couldn’t be happier to be part of the Aladdin community, and I want to make sure that my seven weeks on the West End really count!